2014 Mercedes E63 AMG Wagon best driver's car on the planet? Two Mercedes automobiles made Motor Trends “Best Driver's Car” list, the 2014 SLS AMG Black Series and a surprise 2014 E63 AMG S-Model Wagon. When you think of the best driver’s cars in the world you wouldn’t ever come up with a wagon. But Motor Trend put the new 2014 Mercedes-Benz E63 AMG S Model Wagon on the list. It’s no surprise that they also chose another Mercedes, the 2014 SLS AMG Black Series Coupe. But anything from Mercedes-AMG GmbH is going to be something any performance enthusiast is going to enjoy driving. This wagon is much more than just a stylish Mercedes wagon with a high-performance AMG engine stuffed under the hood. It’s a “wholly engineered” pure performance car engineered from the powertrain up to become a unique performance masterpiece. This the is best driver’s wagon on the planet. And it’s one fast grocery hauler. The S Model is the most powerful production wagon in the world. It comes from AMG GmbH with 585 horsepower and 590 lb. ft of cargo hauling torque. It comes coupled to a newly developed, performance-oriented AMG 4MATIC all-wheel drive system that will transport the family in wet or dry conditions safely. The all-wheel drive system is also designed to provide exciting driving dynamics on trips to the grocery store. If you are running late, Mom can get the kids to the soccer game in record time. 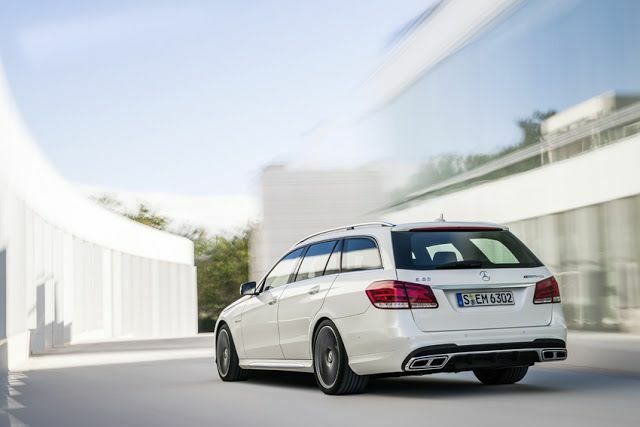 The E63 AMG S Model Wagon will sprint from 0-100 km/h in just 3.7 seconds. And it has a top speed of 155 mph if you can find a road that’s safe enough. The power comes from the AMG hand-built 5.5-liter V8 that represents a 28 hp increase over the previous AMG performance package that was available as an option. The powerful V8 powerplant comes mated to an AMG SPEEDSHIFT MCT 7-speed sports transmission. The driver scan chose between four modes, "C" (Controlled Efficiency), "S" (Sport), "S+" (Sport plus) and "M" (Manual). In "C" mode, the ECO start/stop function is active and switches off the eight-cylinder engine when the vehicle is at a standstill. Mercedes says the engine and transmission are far more agile in "S", "S+" and "M" mode. Did the 2014 Mercedes-Benz E63 AMG S Model Wagon or the intoxicating SLS AMG Black Series Coupe win the Motor Trend “Best Driver’s Car” of the year? It was won by the Porsche 911 Carrera 4S. But you can be sure, the E63 AMG S Model Wagon is the best driver’s wagon on the planet. Watch Choosing the 2013 Best Driver's Car Contenders! video.